Archbishop emeritus Antonius Jan Glazemaker died in Amersfoort on Saturday, 20th January 2018, aged 86. Archbishop Glazemaker was not a man of high-flown theories, his feet were always firmly rooted in the ground (he spoke openly of his farming background); and he was a man of the people. In his sermons, he would often link the biblical texts to the current events of the day. His loyalty to people was borne out by his wide circle of friendships and contacts, often maintained over decades. Married to Gerda de Groot, he began his pastoral career 1956 as priest in Leiden, then from 1963 served as pastor in the large parish of IJmuiden. The sixties and seventies were formative decades in him: The Second Vatican Council was accompanied by a thaw in the centuries-old frozen relations between Old Catholics and Roman Catholics; and ecumenism flourished. Archbishop Glazemaker enjoyed the new relationships and understandings, and served ecumenism as priest and later as bishop; working, among other things, as a member of the Council of Churches in the Netherlands. 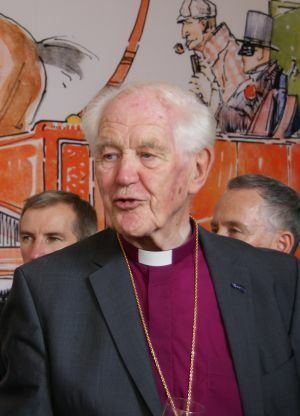 In 1979 he became Bishop of Deventer and three years later, at the beginning of 1982, he was elected Archbishop of Utrecht, and thus President of the International Old Catholic Bishops' Conference. In this role, he always made the fostering of relations with the Roman Catholic Church and with the Orthodox Churches a matter of key importance. Together with the Secretary of the Bishops' Conference, he promoted international contacts at every level, including the WCC. He regarded the cohesion and unity of the churches of the Utrecht Union to be of vital importance. Just how greatly this work was appreciated by other churches was demonstrated in 1989 when Archbishop Glazemaker was awarded an honorary doctorate from the Christian Academy in Warsaw. Under his presidency, the IBC dealt with a number of challenging issues that arose from the social changes of the times. Perhaps the most difficult issue was the introduction of the ordination of women to the priesthood. This process took many years. Once convinced, however, Archbishop Glazemaker, stood by the decision with all its consequences, even though he deeply regretted that this change of policy in the Utrecht Union ultimately led to the withdrawal of the Polish-National Church of America from the Union. Within the Bishops’ Conference there was a special relationship between Utrecht and Bern, as a special friendship developed with the Swiss Bishop Hans Gerny. Both served their churches as bishops at more or less the same time, and they worked closely together as President and Secretary of the Bishops' Conference. On 12th February 2000, at the end of a special celebration, Archbishop Glazemaker handed over the crosier of the Bishop of Utrecht to the Dean, who laid it on the altar of the Cathedral. Even in retirement, Archbishop Glazemaker continued to play an active part in the life of his church and to delight in his growing family. Now he is gone from us. May he rest in peace.